Mellow Yellow is the oldest modern-day coffee shop Amsterdam has, being founded in 1967 and then in 1972 becoming the first coffeeshop to officially be tolerated by the Dutch government. 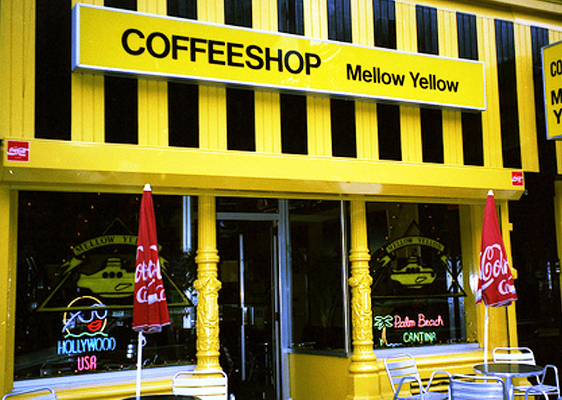 The coffeeshop has been restored by the owner in a way to recreate the unique atmosphere and special feeling of the original Mellow Yellow, and boasts a distinctive decor that can’t be found in any other coffesshop. Mellow Yellow is on split floors with the upper level being home to a pinball machine and table-soccer. Inside, you are able to buy a selection of food and drinks to go alongside the wide range of specialised cannabis on offer.